For a better understanding of the cleaning operation with our chemicals, kindly download our cleaning chemical matrix here. Stromme Aquaclean is a well known, tested and effective product for the cleaning of the cargo holds, developed from the wide experience of Stromme staff involved in cleaning operations of cargoes carried as dry bulk including those classified as ‘oily’ e.g. petcoke. To view full product information sheet please click here and to view product guidelines click here. For more information on product usage guidelines visit our YouTube chanel. Stromme Holdcoat FC is a highly effective and "ecological fair" product. It provides a thin temporary film as a barrier between hold paint and dirty/corrosive cargos. It prevents contamination of the cargo from the hold paint and it protects the cargo holds from staining and helps to release the cargo residues from the holds and thereby makes the cleaning easier after discharging. Stromme White Pigments is a highly innovative Product to coloring Stromme Holdcoat FC. After application and drying the coating is slightly white. It will be a white layer and you can see immediately where is protected and the surveyors and port authority can easily see the cargo holds are protected. Stromme Cement Remover is an acid detergent product to remove cement in cargo holds from sea going vessels, also useful for cleaning cement vehicles and cement pumps. It may also be used for the removal of lime scales and cargo residues of iron ore.
Stromme Rust Remover is an acid detergent concentrate for the removal of rust residues from deck paint. This remover reacts autonomous. The surfactants provide good soil removal. Repaint the treated surface after the cleaning process immediately. Stromme Dosing System is a easy to use and cost effective and ecological product. Saves up to 70-90% of the vessels chemical use. Access to the concentrate is not possible and only ready to use cleaning chemicals can be discharged. The change of the proportioning cans can only be done by designated persons. It ensure a high operation safety and is certified by Germanischer Lloyd. Ready mounted and installed, easy to use and operate. Stromme Ships Cleaner is a mild alkaline concentrated ships washing detergent with strong soil carrying capacity for removal of typical dirt on ship’s deck, accommodation and engine room. It has a demulsifying effect which assures a perfect operation of the bilge water separator. The cleaner contains renewable components and has a good ecological profile. Stromme Engine Cleaner is a highly effective and powerful alkaline cleaner with a good dirt carrying capacity. It is an excellent basic cleaner to remove oil contaminants in the engine room and also clean thoroughly enough to ensure a grease-free surface prior to applying a new paint finish on the cleaned parts. It is also useful and effective as a circulating cleaning solution and immersion soaking bath solution in the ultrasonic cleaning machine. To view full product information sheet please click here. Stromme Interior Cleaner is a very mild alkaline cleaner, it is exceptionally gentle and kind to the skin, therefore it can be used without any worry and hesitation by anyone and it is suitable to use on any surface on board the vessel. 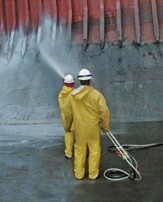 Stromme Cargo Hold Cleaning Products. We provide all the necessary equipment and chemicals that are powerful and easy to operate so that customers can clean their cargo holds efficiently and quickly. To view a full range of our cargo hold cleaning products and our cleanliness guide, please click here. Stromme Pump Spray Foam System. This spraying system can be used either with the stainless steel lance and nozzles for cleaning with acid or with the aluminium spray foam lance for alkaline cleaners. It is a compact, versatile, effective and easy to assemble cargo hold cleaning system. Stromme Tank Spray Foam System. This foam system is a labour and cost saving equipment when it comes to cleaning of cargo holds.It is specifically designed spraying applicator delivered in a foldable storing container which makes it convenient for transport and storage. The Stromme Handy Spray System is a portable ready to use electric driven chemical sprayer. It is used for spraying chemicals such as Stromme Aquaclean HD, Stromme Holdcoat FC and Stromme Ships Cleaner up to a height of 12 meters. Highly effective and reliable plus unique in its simplicity the Stromme Combi-Jet can clean the cargo holds efficiently thereby save time for the crews. The Stromme Maxi-Jet is designed to give the highest and strongest water jet possible when connected to a bulk ships normal installation. This has been made possible by an accurate venturi system, the use of compressed air and maximum volume of water. Even rust scales are loosened and flushed away when Stromme Maxi-Jet is used. Electric driven Stromme Submersible Pump Set suitable for handling drainage of waste water and sludge after cargo hold washing. Stromme 50 MB Diaphragm Pump. The Stromme 50 MB Diaphragm Pump is a compact and effective portable air operated oscillating displacement pump which pumps the product through two chambers. Both of these chambers are separated into an air and a product section. Mari-Clean multi-purpose high pressure cleaners are a labour-saving and cost-efficient solution for general cleaning and maintenance tasks onboard. They are easy to operate and maintain, requiring a minimum of training. For more information on Mari-Clean products visit our YouTube chanel.